As the participants come into the space, the facilitators of Cornerstone (list below) lead them to their seats, and offer water and Flavoraid. For the next 90 minutes, the seminar program unfolds and the participant exercises take place, in congress with several principles of Cornerstone. What becomes a bit strange, besides the sweet taste of the Flavoraid, is how the facilitators interact with each other. It seems that two brothers now own the rights to the seminar, and reveal that the founder of Cornerstone has recently died. When a presenter is not doing an exercise, they are scattered throughout the gallery space, and listening in on their conversations may provide some truth about the nature of what is happening. This break down is interactive. As the seminar goes on in the background, the facilitators are breaking off into their own conversational groups. If, for example, a participant goes to get more Flavoraid, a facilitator might engage them with secret plans for takeover, or documents that prove Cornerstone’s less-than-savory situation. On the night I attended, a reporter was present. Her persistence definitely upset the presenters and their presentation. The facilitating faculty includes a lead therapist (Dr. Phranque Wright) who blasts off the presentation with a wild and enthusiastic explanation of Cornerstone. 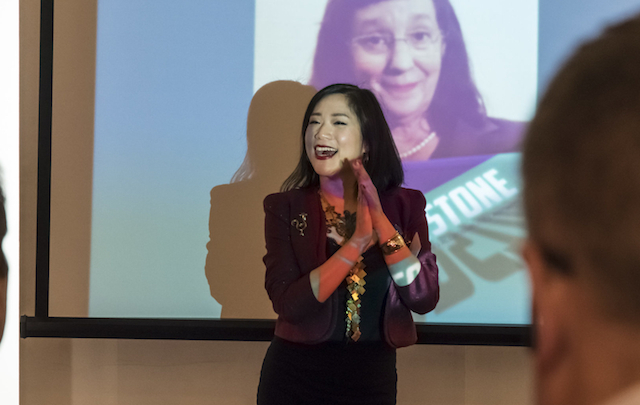 Another presenter (Wanda Jin) seems on the edge of a breakdown… her maniacal laugh, done often and nervously, is definitely hiding something behind her facade. 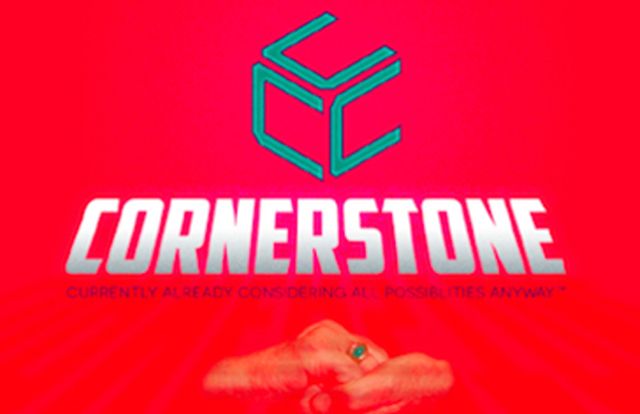 Fellow participants, like a female gay couple, are revealing things that are beyond the responsibility of Cornerstone. These audience members are often whisked away, to do paperwork or to be given a “secret” conference. The audience participants – as they come into the presentation – are given instructions to roam freely, and that interaction becomes part of the overall presentation. One facilitator slipped me a book, which explained many of the guiding principles of Cornerstone, containing a read-between-the-lines chilling effect. The idea for the participants is to make your own journey, whether it is in the main room or outside what is actually being said… both journeys yields different levels of truth. Nothing Without a Company (NWAC) was wise to be the guiding collaborator with Cornerstone, as they exposed exactly the situation in real time. The principle concept was put in motion with Cornerstone by Jake Fruend and there was also written collaboration by Kevin Sparrow. In addition, one of NWAC’s directors, Rose Freeman, obviously used her power of persuasion to make sure the Cornerstone facilitators do the right thing. The rest is up to the participants… are you ready to move “Forward”? That is the Fifth “F” in the Cornerstone “instinctual response” principles. Please attend to interact with the other four.